I guess I got kind of bored and I think this would be an interesting game to hack. 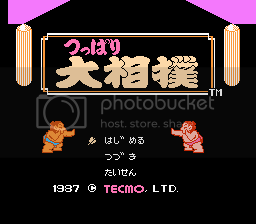 Please enter the information about the sumo wrestler. Coach, please select a room! I'm -totally- guessing on these names, since I have no idea how that whole "select the readings for names" thing works. 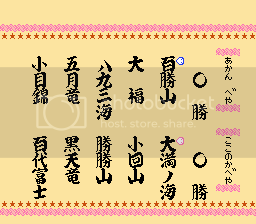 The next screen has the character names on the side from before. Keep it together, Senkai! (Senkai is a name). Awesome! You can get into the Tecmo room now! And you can't make me touch the last one. 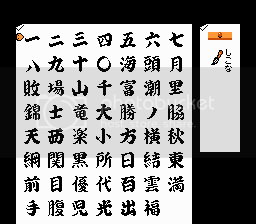 Too many kanji I don't know. Thanks, I'm not even sure I'll end up translating the names. Might not be able to fit them all in 8 tiles. As for that last screen, not too sure what's going on in the middle. See there's 4 kanji for the first name and then up to 3 kanji for something else then back to 4 kanji for the name. 部屋 in the context should be translated “stable”. Why? I dunno who decided it originally. But you wouldn’t be likely to call some place a recording office, or an advertising bureau, or a law concern; the preferred terms are studio, agency, and firm, respectively. So it is with sumō stables. 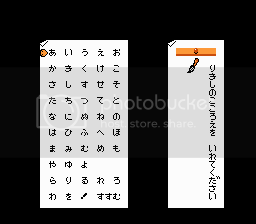 The only Japanese site that hazards guesses (which itself admits that they are guesses) says: Hyakushōsan, Omawarisan, Yakuzaumi, Kachikachiyama, Satsukiryū, Kokutenryū. 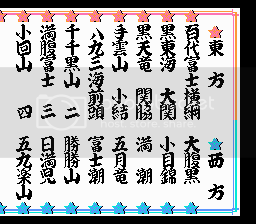 Satsukiryū, at least, was the shikona of a real rikishi, and some of the names (like real sumō names) have positive connotations. 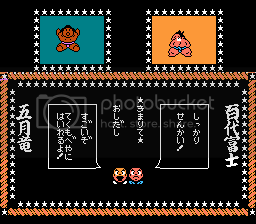 Like a lot of these Tecmo sports games, some of them are whimsical puns (o-mawari-san means policeman; kachikachi-yama comes from a Japanese folktale; hyakushō could be “a hundred victories” like the kanji says, but with a different “shō” means “farmer”). 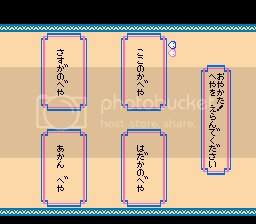 I'm bumping this to see if anyone has any suggestions for creative ways to translate the title and so that this thread isn't eventually pruned because I plan on converting all of the vertical stuff to horizontal. Anyway, I've had several title screens designed for me and I might as well add another to the list. Wait, I thought of something. Clash of the Sumos anyone?